Doesn't get much more Copenhagen than this. Elegant and sweet smiling face. This really makes biking look so glamourous. I want one! "Doesn't get much more Copenhagen than this." To be more serious, that is a gorgeous picture. 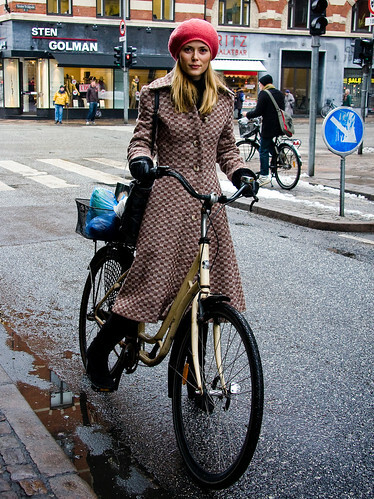 I wish we were as chic on our bicycles here in Chicago. Your blog inspires me! I wish Chicago's infrastructure for biking was half as 'chic' as Copenhagen... Then we wouldn't feel the need to dress so scruffy! A beautiful capture of a beautiful woman. Why don't people wear helmets in Copenhagen? Is it not legally required there? Because it's safe and there aren't any statistics showing that North Americans are safer than europeans because we wear helmets more often. Safety is all about good infrastructure and public education campaigns. helmets?! helmet wearing rates in the European union are about 5-10%. As for laws forcing people to wear them, there are so few places in the world that have such laws. they are the rare exception to the rule. Who needs a helmet when you are a traffic stopper. She is really a vision of elegance. Love the red beret and the simple hairstyle. What a fashion and biking inspiration. I don't just love this photo, I want to be her. Wow, check out that bicycle! Is that a Biomega?! Yes!